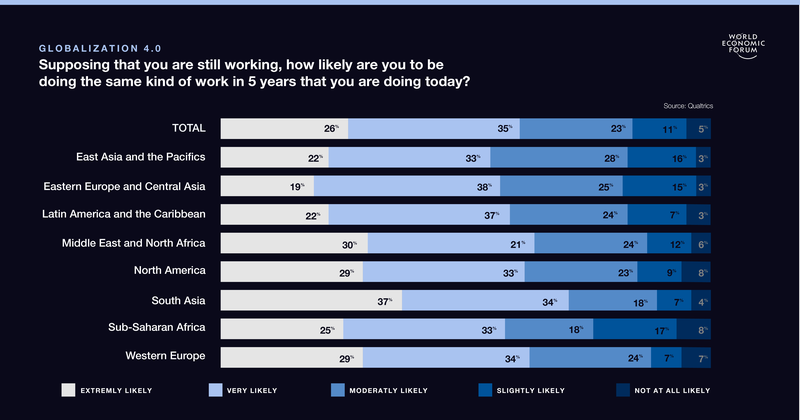 The rise of populism, nationalism and protectionism are all associated with waning support for globalization, but a new poll for the World Economic Forum’s Annual Meeting 2019 shows high levels of support worldwide for international collaboration, immigration, and the personal benefits from globalization. Concerns about the rise of nationalism and isolationism dominate the global political agenda. 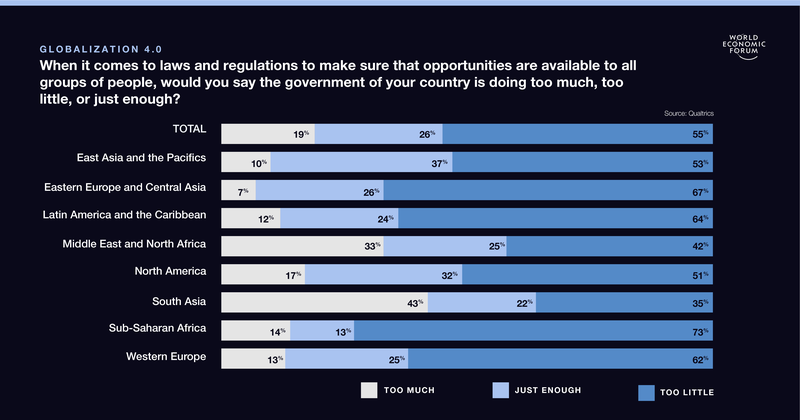 But the survey suggests there’s a bedrock of support for international collaboration with majorities in every region agreeing that countries should help one another. That sentiment is particularly strong in South and East Asia and in sub-Saharan Africa. Immigration is an emotive subject in many countries. But majorities view migration as positive in all regions except Europe. 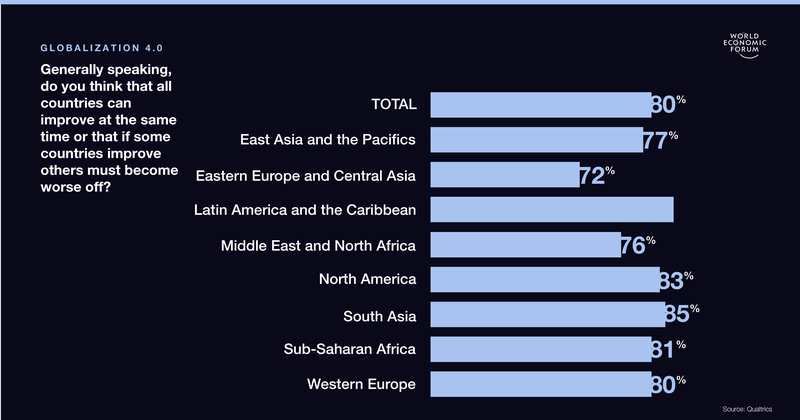 Support is particularly strong in South Asia and North America. 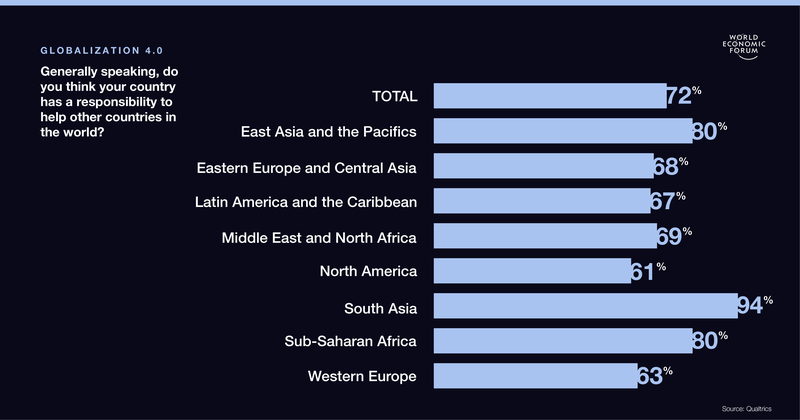 Respondents were asked whether other countries should be considered competitors or collaborative partners when it comes to development. There were overwhelming majorities for the collaborative view with Latin America, South Asia and North America notably strong. 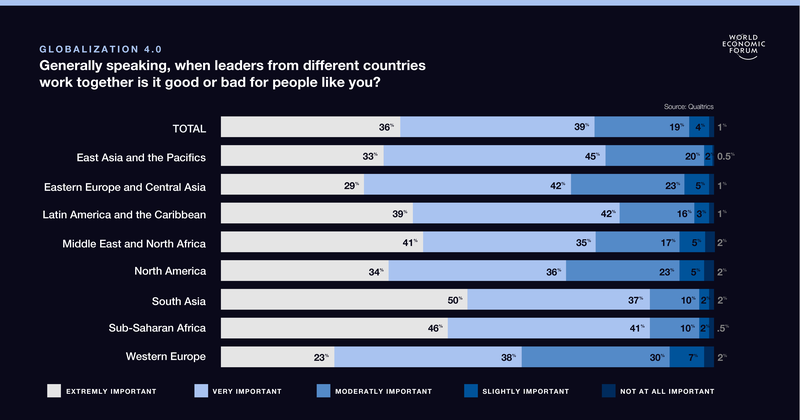 Taking the idea of global cooperation a step further, respondents were asked whether things improved for them as individuals when their leaders collaborated with those of other countries. Big majorities everywhere think collaborative leadership leads to better personal outcomes. Technical change is driving much of the disruption affecting citizens around the world. 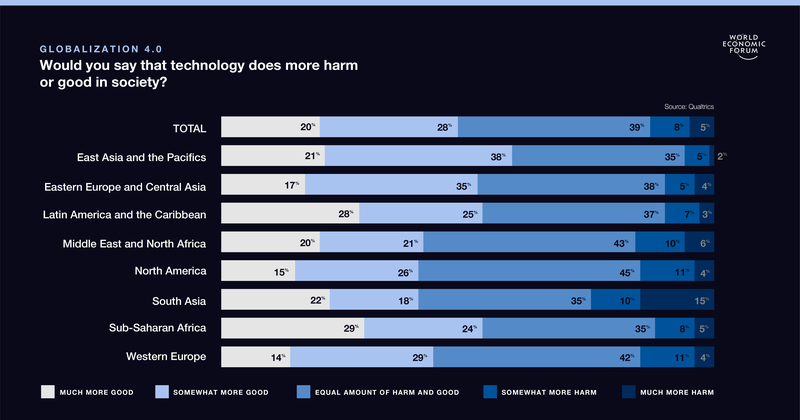 When asked whether new technology was a force for good, those who agreed far outnumbered those who disagreed. But the most popular response in all regions was one of ambivalence. Much of the debate around Globalization 4.0 centres on the accelerating change new technology will bring to the workplace. 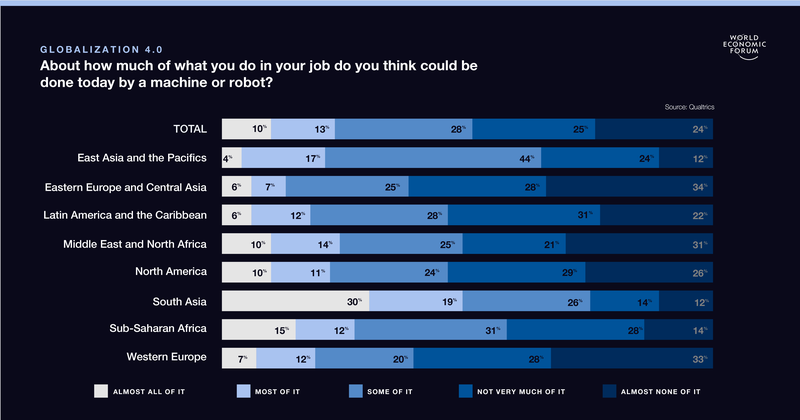 But workers outside South Asia aren’t expecting to be replaced by the bots any time soon. 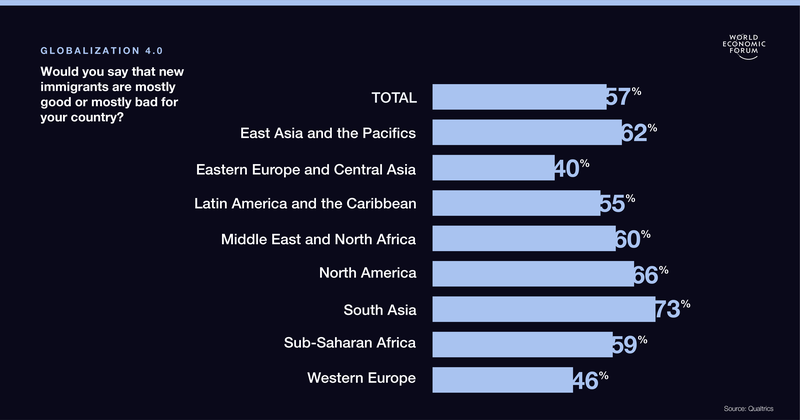 In all regions, citizens think their education systems are leaving too many behind in the Globalization 4.0 challenge in all regions. 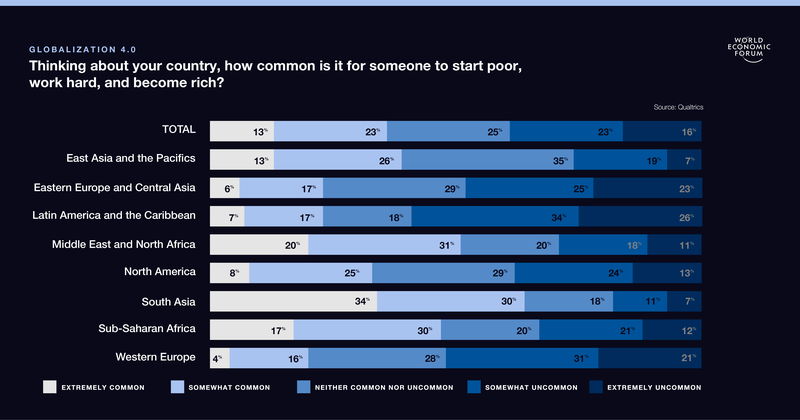 Outside South Asia, there are concerns about social mobility - defined as the likelihood that someone born poor might become rich. Such concerns are particularly acute in Europe and Latin America. In general, social mobility is perceived to be more of a concern in the developed world. The benefits of globalization won't spread to everyone unless the right government policies are in force. Here the clear message from the survey is that more action is required. For the full set of findings see here.